I had to read this one. The title alone pulled me in, then of course, there were the beautiful daisies on the front cover and the beautiful authors that make up this compilation, some of my favourite writers. The Beauty of Grace – stories of God’s love from today’s most popular writers by Dawn Camp. I read slowly and savoured each piece. It’s good to know that others have needed grace just as much as I do. It’s good to remember that God is good and faithful. Go ahead, give yourself a breath of fresh air and pick up a copy at your favourite bookseller, it will be a gift to yourself. The Beauty of Grace was supplied free of charge by Revell, a division of Baker Publishing Group. Robin Hood has nothing on this young lady. Lady Merry Ellison has had to learn some life lessons that most young women of nobility wouldn’t know. She can fight, she can shoot and she can command a small group of rag tag children and teens and make them into the notorious ‘Ghosts of Farthingale Forest’. Her life was dramatically altered, along with the children she feels responsible for, when her father rebelled against the crown and was killed. Emotions have been suppressed and it feels like there is no where to go. Help comes from inside the palace that is threatening to crush her. But a fearless young woman can become too self-protective when so much is at stake. Is there any room for anything else? I won’t tell you any more because you’ll want to read the story for yourself! My dad and I both enjoyed reading Dauntless. You can pick it up at your favourite bookseller! 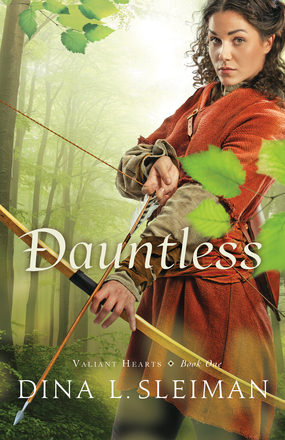 Dauntless was provided free of charge in exchange for my review by Baker Publishing Company.